Beautifully engraved certificate from the justWebit.com issued in 2002. This historic document has an ornate border around it with the Company's trademark. This item has the Company's President's signature and a countersignature of the Atlas Stock Transfer Corporation's registrar. This certificate is over 9 years old. 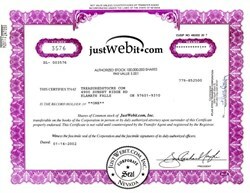 Effective on November 6, 2002, the company changed its name from Justwebit.com, Inc to Synthetic Turf Corporation of America. The name change was to reflect the change in core business that was anticipated at that time. Unfortunately, the grass wasn't any greener at Synthetic Turf Corporation of America.